Bausch & Lomb is a renowned solutions and contact lens manufacturer. Among its various products Renu Multiplus contact lenses solution is one of them. 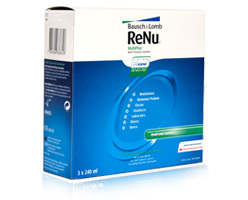 Renu Multi Plus solution enhances comfort by making it easy and healthy to use contact lenses. This solution is specially designed for soft contact lenses. It has a chemical which kills germs in just 4 hours which renders contact lenses healthy, free of germs and highly usable. 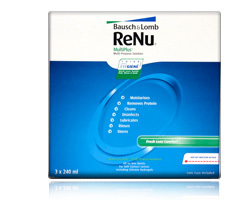 Renu Multiplus contact lenses solution from Bausch & Lomb contains an agent which will remove deposits of protein while cleaning and disinfecting the contact lenses. It is also possible to keep the contact lenses immersed in the solutions for longer durations. According to eye specialists, this solution is extremely safe and effective for the cleaning of soft contact lenses. It is also designed for No Rub and Rub regiments. In all cases however, it is always advisable to go consult your eye specialist. As your eyes are the most important part of your body take the utmost care while choosing a product. Keep in mind that some solutions may not suit your eyes. This is why you should exercise utmost caution while choosing the correct product which will ensure that your eyes are healthy and safe. www.contactlensesexpress.co.uk provide all types of contact lenses solutions with various brands. Eliminates the need for a separate enzymatic cleaner in many patients when used daily. For use as a daily cleaning solution. For use as a rinse after use as a daily cleaner. Do not use if patient allergic to any ingredients. Should also be used to clean your contact lens case. Always make sure your hands are clean when handling solutions and contact lenses.